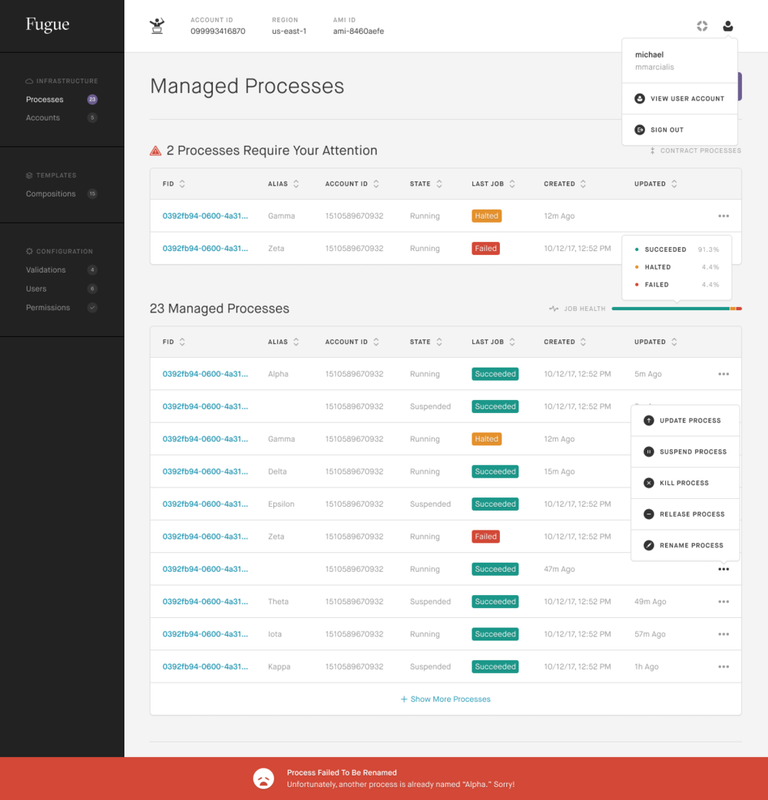 Fugue needed a GUI for their platform which was a dev-ops solution for declaring, instantiating, and enforcing cloud infrastructure. Before the need for a GUI, Fugue's only interface was on the command line. I left Fugue before the product launched. Much of the functionality and requirements were already implemented in the CLI that the Design Team at Fugue spent months working on these wireframes just to meet feature parody. We kept our wireframes and design ideas lo-fi, and I performed rapid usability testing to validate our ideas by putting together a prototype with the help of marvelapp.com. One big challenge with EWC & Fugue was solving for asynchronous experiences. Many of the actions a user could take would result in work being performed that may take as long as 15 mins. We needed to create a UX that would not be "blocking" (holding a user in place until the desired user action successfully completed). I spec'd out a "Notification System" that could help keep EWC's usability above-par with regard to system transparency. This was a document used to communicate with engineers, designers, stakeholders, and product managers how the Notification System could work for viewing "dry-run" results. A "dry-run" was essentially a report of what Fugue would have done based on the user's inputs–for auditing purposes. The challenge: after requesting the dry-run, Fugue could take up to 5 minutes to return a result*. *Not Fugue's fault, looking at you AWS! This was a document used to communicate with engineers, designers, stakeholders, and product managers how the Notification System was designed against an concurrently worked on API contract.